While yesterdays attention shifted to the Galaxy S Blaze 4G as T-Mobile announced pricing and date with a midnight press release, todays attention shifts back to the upcoming HTC Ville. 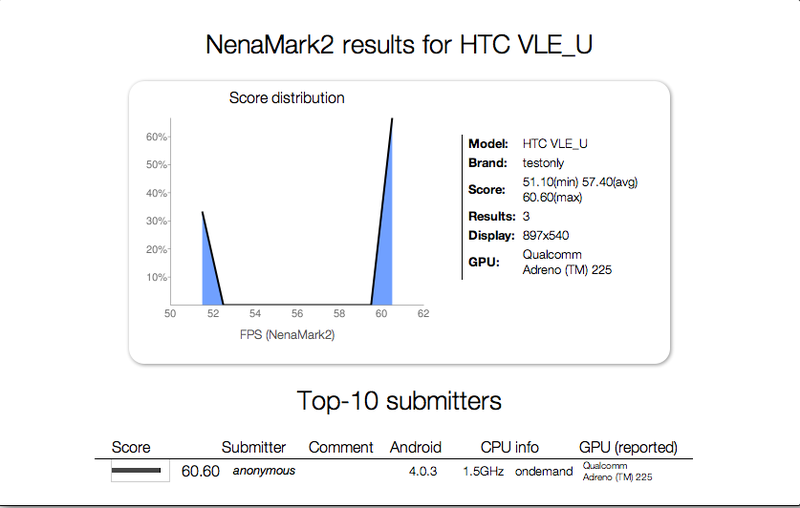 Thanks to a link to the Ville’s NenaMark2 benchmark results, we’re looking at a very impressive 60.60fps. Yeah, this phone will be awesome. I’m not very fluent with these scores so I’ll rely on our readers to tell me just how awesome this score is, but I imagine this is the phone to look forward to for T-Mobile. The Ville’s spec sheet includes a dual-core 1.5GHz Qualcomm S4 chip, 4.3? Super AMOLED qHD display, 1650mAh battery, 8 megapixel camera capable of 1080p recording and a super slim profile. At least, that’s the rumored specs so far, with Mobile World Congress next week hopefully we’ll learn more about the HTC Ville. ← T-Mobile “G4X” On The Horizon? Follow Up To The LG G2x? Impressive. The display resolution seems a little off though. It should be 960×540, not 897×540. If they had just put a 720p display on this handset I’d have held out for it and picked it up on its first day of release. As it is, I’ll just keep my “free w/rebate” Amaze. The resolution error is probably because of onscreen buttons – Galaxy Nexus had same issue. check out the phone on the link. It has physical buttons. What is wrong with HTC and batteries??? 1650 again?? sensation shipped with 1500 mah batteries and battery life is alright, you can always buy a 1900 mah anker! http://nena.se/nenamark/view?version=2Basically the Ville performs better than any other phone for the moment. qualcomm s4? i thought the rumor was that the ville would be a qualcomm s3? im pretty sure qualcomm said there would be no s4’s coming to mwc…come on tmonews..
Look at the GPU in the test results (Adreno 225). So far only S4 uses that. And where’d did u get S4 wasn’t going to be shown? Qualcomm might not be there, but their partners (or just HTC) will show of S4. No, all the leaks pegged the Ville as an S4. Your comment above is the first time I’ve heard anyone refer to it as an S3. Wheres my Nexus TMo ? I have the Amaze, the Ville is just another dud like the Amaze. I want a Nexus and I’m tired of waiting. If TMo doesnt get it soon I’m switching to Verizon. Who stole my TMo and replaced it with a dud ? My TMo used to have the best cutting edge phones of any carrier, now they have reruns……or maybe they just have the runs. Seriously… I want a Nexus too but from a real store, not online. I skipped the S from Best Buy. Where is Best Buy and the GalNex when I need you?? I’d rather have the HTC Edge! Google it if you don’t know about it. That phone is a true beast and hopefully it comes to t-mobile…. Sounds like the Ville is going to get “Sensationed” by the Edge/Endeavor what every it turns out to be. Ok …. much better than the blaze 4g but PLEAZ Tmobile get the Nexus or the GALAXY NOTE!!! So according to available benchmarks the S4 is faster then the Tegra 3. ha ha! In my opinion, “the phone to look forward to” is a TMO Galaxy Nexus. I do not mind paying unsubsidized price but buying an import with no warranty worries me (and no, I do not trust Newegg). When TMO? When? Nexus in the US please! I do not care about the cash. Best Buy or something!! Newegg has been around forever, and is one of the most reputable computer suppliers ever… If you don’t trust Newegg, then you shouldn’t trust buying anything online. I have bought over $10k worth of computer parts from Newegg over the last 6 years and have never had any issues, even RMA’d a motherboard that was over a year old, and was no longer covered by the manufacturer (crazy huh?). BTW, Newegg offers a 90 day warranty on the phone, through a third party company called Brainstorm. Way better than the manufacturer or most other vendors offer. any phone wanting to call itself high end in 2012 that doesn’t have a 720p or higher res should be shot. This is a mid range phone on HTCs big three phones and we should be insulted we get this while AT&T gets the better one. You hit the nail on the head. I don’t get why T-mobile settles for inferior phones. What did att get..thats better..? I agree, but I’d rather have a mediocre phone on T-Mobile than a top-of-the-line one on AT&T. Somewhat unrelated, but I’m trying to decide if having QHD OLED is a worthy trade for 720p LCD. I’ve been spoiled by OLED for the past 2 years and don’t think I could go back to LCD at this point. I have been reading comments on this website for awhile now. A few years ago, people were talking about how t-mobile phones did not compare to what others had to offer. Now, t-mobile has stepped up their technology with leaps and bounds. Yet some of the comments are still negative. If some of you do not like what is being sold by t-mobile, then there are three other major carriers to choose from. Pretty sure some of you will find something to complain about on another carrier. Life is not perfect. Neither are cellphones. Live with them or manufacture your own. Hey, looks like you found something to complain about too. Welcome aboard! i’m wondering why people like you even visit websites like this? boredom? Catch up to what, this phone is awesome…. Have you played with the phone yet in order to say that its awesome? Amaze will be using ics soon enough. Htc bumps out to many handsets. You do have to factor the oem and carrier both need to approve updates. I am glad that tmobile is busy passing on crap updates and focused on reliable ones. I would be happy at first with everything getting quick pushes until 70% of them are fail. I’ll be impressed when I see a video where it can handle it’s own terribly-implemented UI without dragging frames. Keep throwing specs at the problem, HTC, it will work out eventually. For the people that are down playing this phone, your forgetting one crucial fact, this is an S4 dual core. Everything that I’ve read thus far says that the s4 dual core smokes the tegra 3 quad core processor. I can’t wait for this personally, tegra is a good processor but their claim to fame has always been that they are available first. I agree that ppl are down playing this with out understanding the difference there is between the S3 f S4 , but ” smoke the Tegra”? Im typing this on my Transformer Prime, & I don’t see anything smoking it in the near future…. Is your Transformer Prime running sense and wasting resources in the process? No? Well look at that?! Do you homework. The krait architecture of s4 is faster than the arm9 cortex in the Tegra 3. The S4 benchmarks are faster for dual core and when the s4 quads hit later 2012 the tegra4 will be completely buried. the phone will still lag .. it’s Android .. it’s inevitable no matter the processor. Very ignorant comment. My Sensation runs buttery smooth on an early preview build of ICS. It also ran perfectly smooth on CM7. It had some noticeable lag when it was stock, but I rooted it before the couple maintenance patches were released, so I can’t vouch for the speed after the maintenance releases (although others on XDA forums claim it helped a lot). People have been saying this since Android’s inception, but there is no difference between an iPhone and Android speed wise once you are running ICS and can make use of the hardware acceleration. And supposedly, the Sensation is the slowest of the dual cores… right. There is no doubt that Android phones get released with buggy or slow versions, or with limited hardware that isn’t up to the task, but to group all Androids into this category (especially a dual core S4, is just silly). I hope you are enjoying your iPhone. I agree with u but don’t forget Android phone sout the box run laggy until you root it. I’m so sick of Sense I wish HTC would sick with Plain old AOSP and leave the garbage alone. i don’t have an iPhone .. i have a Sensation, GS2, HD7 and Titan .. you just agreed to my point though thanks .. i’m just stating the obvious .. you can’t find an Android owner out that doesn’t suffer from lag here and there .. i’ve never encountered such on my WP . .either of them. Same here. I went to WP7 to escape the Android Rat Race like the one coming with the Ville and I have never looked back. Now, on my Nokia 710 or Radar 4g can make it through a full day with only a 15 minute recharge in the car. I can wait for Apollo to get here so WP7 can get into the awesome hardware that we are seeing pop up for Android phones. That is the one great thing about Android: it is very versatile and the amount of Hardware options is mind-boggling. exactly Pitt . people get in a little tizzy over phones it’s crazy … it is what it is though .. i’m still looking for an Android phone i like that’s compatible with TMO’s 42Mbps .. maybe the Ville will be that phone. I’d like to see someone besides Samsung go qHD. This is an HTC phone. HTC went qHD with the release of the Sensation, which was nearly a year ago. From what I understand, they were the first manufacturer to release a phone with a qHD display. I’ll be buying this & then waiting for htc w/ their quad coreI can never have too many phones! Hope this phone lasts longer than the 3-4 hours that the Amaze does. Sounds good though. come on.. really?! I would much rather forgo the super slim form fact for a phone that will last me a whole day without intensive battery saving measures. Get a BlackBerry as a device and an iPad or an android tablet for apps.that way the battery will last and people wouldn’t have to get the new and greatest android when in a months time something better comes out and the os is so laggy.left the amaze for the s2 due to bugs and left the s2 for the 9900 and haven’t had no hiccups in performance. MMy sensation is great except battery I can’t wait to see in the stores. S4 comes in Single, Dual, and Quad. They (or just their OEM(s)) are reveling the Dual-core S4 at MWC. We are really impressed about this great post, As always we hope this article has been useful! This was very informative. We have been reading your blog alot over the past few days and it has earned a place in our bookmarks.